Mathura Peda is most renowned for its divine and unique taste. Purely made of Khoya and Sugar and flavoured with Cardamom and Nutmeg. 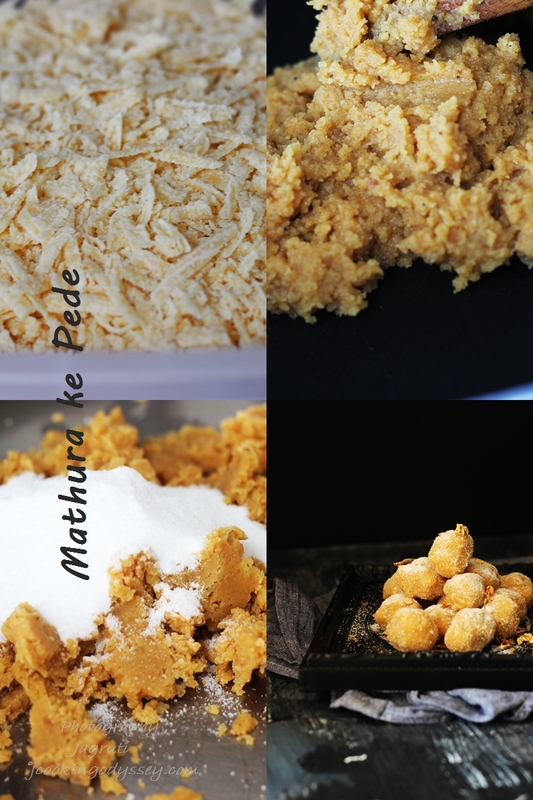 Mathura ke Pede are not just regular khoya peda, they are special. Mathura ke Pede definitely not glossy or sticky, they are in dark caramel colour and irregularly shaped and coated in powdered sugar. Any relatives or friends visiting Mathura, surely they will fetch you one of the most important Mathura ke Pede. According to some research Peda first originated in Mathura itself ( Birthplace of Lord Krishna ) thus these peda are used as 'Prasad' in Mathura temples. I am lucky enough to visit Mathura twice up to now. Once with my parents and recently I took my daughter to Mathura, unfortunately filthy streets, foul smelling environs and food exposed to flies, insects and dust did put us off buying anything edible as for us, it was hard to even breath. So left the idea of getting any prasad, instead got little Kanha and his Jhula ( baby krishna idol and small swing ) as prasad. There was a regret for not getting the Peda Prasad, however I promised my daughter that I will make you Mathura Peda at home. Few weeks back I had chance to try my hands on to making Mathura ke pede for Janmashtami, also used up my homemade khoya. but didn't get time to post on that day. Better late than never ! If you've never made Mathura ke pede, maybe the time is now. If you love peda as much as I do, we are on the same page. Now that Navratri begun, it's a perfect time to try your hands on. They are phenomenal !!!!! Great for Prasad as these peda are nut free, nowadays we are not allowed to take Prasad with Nuts in many places. Fry or roast khoya properly or until totally brown. If khoya roasted properly these peda can stay good until month. Mathura ke Pede tastes divine, made with Khoya. In a heavy bottom non stick pan, place khoya. On a low heat start frying khoya. Continuously keep stirring and frying. In between slowly slowly keep adding ghee and milk. Keep frying khoya mixture until it's brown, but not burnt. This will take 20-25 minutes. Transfer the khoya mixture in another plate. Let the khoya cool completely. Add 150g castor sugar and cardamom and nutmeg powder. Mathura ke pede should not be in any particular shape. Then roll them into remaining sugar. Mathura ke pede are ready for Prasad.Enjoy ! That looks lovely Jagruti ... Lovely writeup ..
What beautiful pics! If only I could eat through my eyes. What shots!! My mouth is watering ...need to make these soon! I'll try your way soon! Looks yum.My favorite kind of pedas. This reminded me of our annual trip to our native place during school vacations, our use to halt at Mathura and this pedas were purchased every journey. Oh my.. no I am craving for some of these sweet babies👌☝️❤️ scumpticous! This recipe is absolutely, positively amazing! I'd love to try to make it, but do you think I can properly execute the recipe even if, alas, I never had some Peda before in my life?